Last month I warned about the bubble in the stock market, and what was going to happen when it popped. 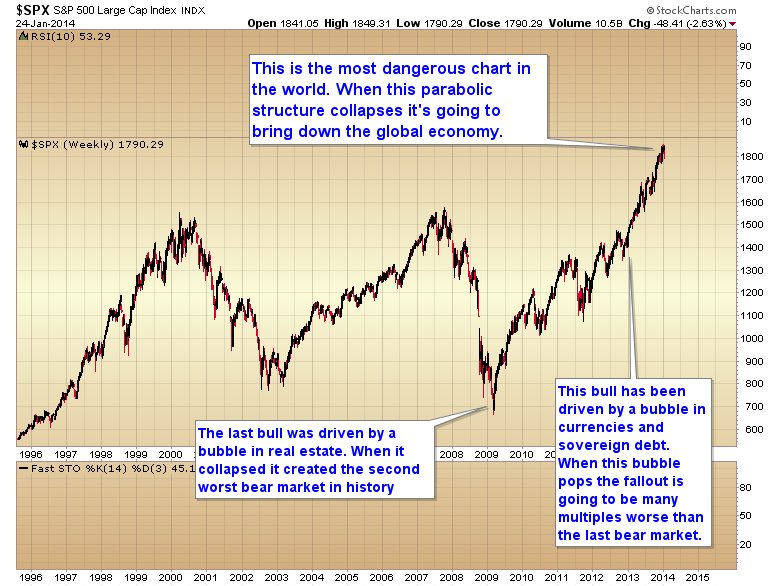 Make no mistake the chart of the S&P is the most dangerous chart in the world. 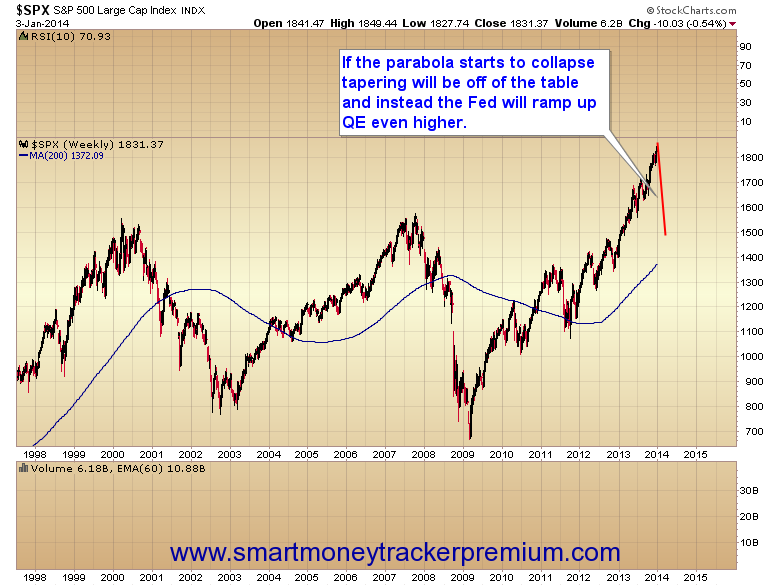 When this parabolic structure collapses, it is going to bring down the global economy. 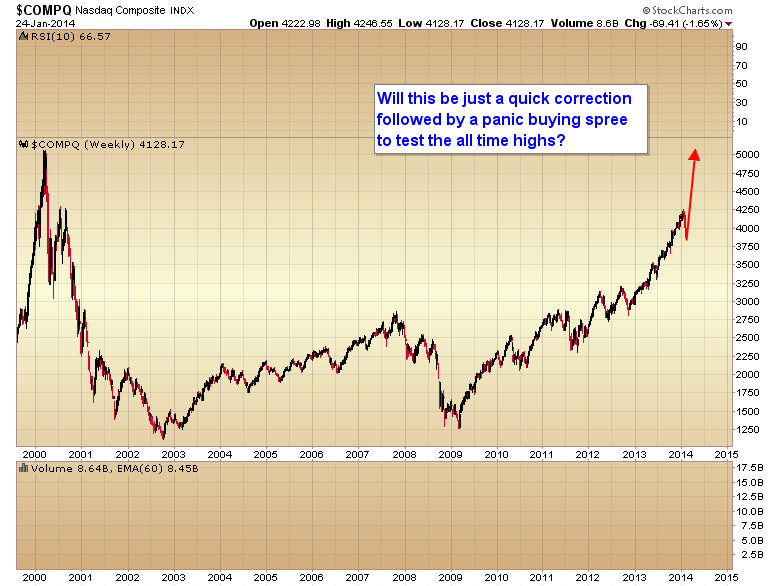 My initial target for this rally was a test of the reaction high on the NASDAQ in 2000. As you can see we came within just a whisker of hitting that target. After what happened on Friday I think we can safely assume that the current daily cycle has now entered its declining phase. As I have noted before, the average duration trough to trough for the daily cycle in the stock market is 35-40 days. Friday was day 24. 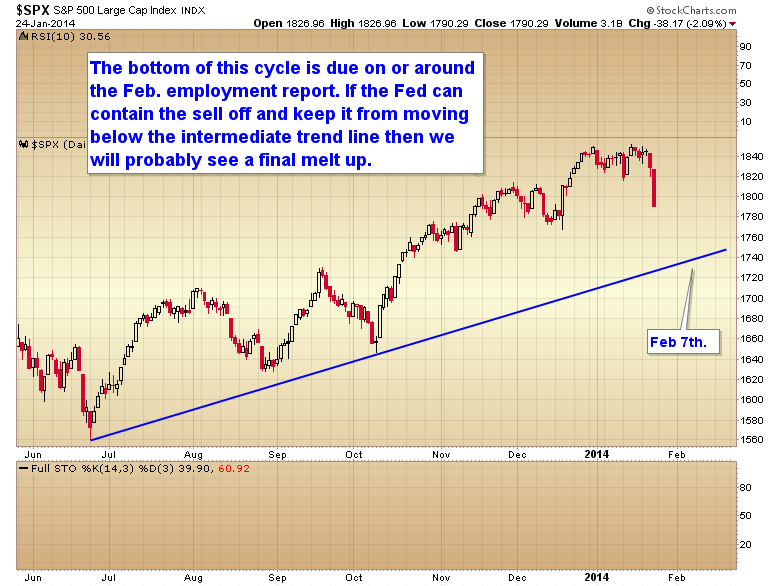 We should expect a bottom probably on the next employment report on February 7. Now here’s the thing, I expect the Fed, and the plunge protection team to go into full panic mode this weekend, come out Monday morning with guns blazing, and try to stop the sell off. Unfortunately this behavior is what has allowed this parabolic structure to develop. 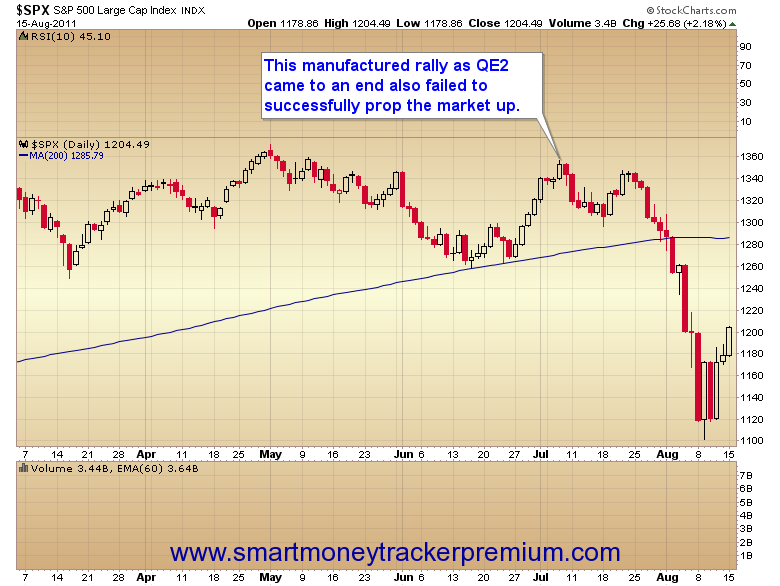 Every time the market has tried to correct over the last year the Fed has prematurely aborted the sell off. I’m pretty sure they are going to try again next week. If they succeed then we will probably have a final panic melt up phase with the NASDAQ testing the all-time highs above 5000 over the next 2-3 months. If on the other hand the selling pressure overwhelms the plunge protection team and starts to spiral out of control next week then we are witnessing the breaking of the parabola and the end of this bull market. Here’s what we need to watch next week. If the Fed can turn this market around and prevent the S&P from breaking through this intermediate trend line over the next two weeks, then this will turn into just a normal daily cycle correction and will be followed by a fifth daily cycle that should include the melt up phase of this bull market. If on the other hand the selling pressure overwhelms the plunge protection team’s efforts to hold it back and breaks through that intermediate trend line early in the week then we are witnessing the collapse of the parabolic structure and I wouldn’t expect it to stop until we reach the 2000 and 2007 previous bull market high support zone. Back on January 3 I instructed my subscribers to buy long-term puts on the market to take advantage of the collapse as I knew it was eventually coming. We should know by early next week whether or not those puts are going to pay off huge in the next two weeks or whether we will take a modest profit and reenter them at NASDAQ 5000. Whether the parabolic structure collapses next week or in two months we all know what the Feds response is going to be. They are going to reverse their taper decision and double or triple down on QE. The problem is that when a parabolic structure collapses it can’t be put back together. My theory all along has been that when the stock market bubble pops the Fed would then completely destroy the dollar trying to pump it back up and that liquidity would then flow into the commodity markets instead of the broken parabola of the stock market and create another inflationary event similar to 2008. Those people that say we have to have wage and employment growth in order to generate inflation are ignoring recent history. We had a severe inflationary event in 2008 while the economy was already in recession and unemployment was surging. You don’t need wage growth to have inflation. You just need a central bank to destroy your currency. The Fed has already destroyed our currency. At the moment the inflation is being stored in the stock market, bond market, and echo bubble in the real estate market. When those bubbles pop the inflation is going to flow back into the commodity markets. This entry was posted in Uncategorized on January 25, 2014 by Gary. 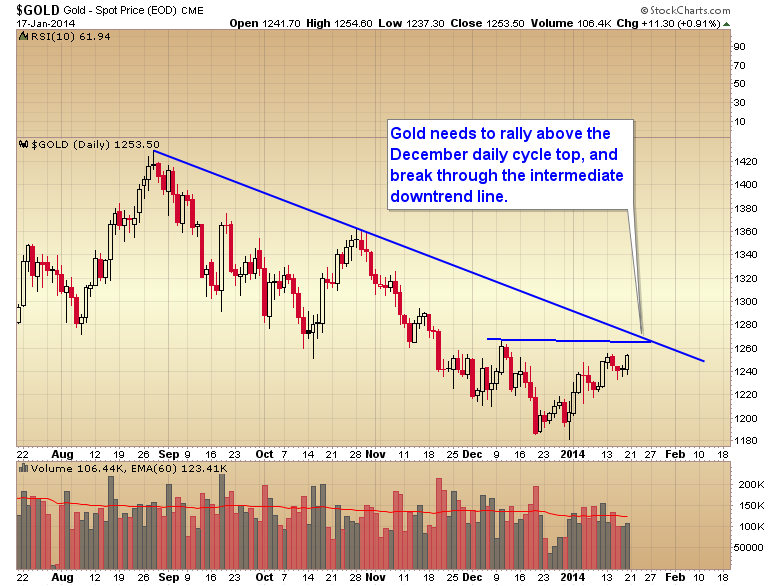 In my last post I noted that gold could give a major buy signal in the next 2-3 weeks. Let me stress again that patience is required right here. 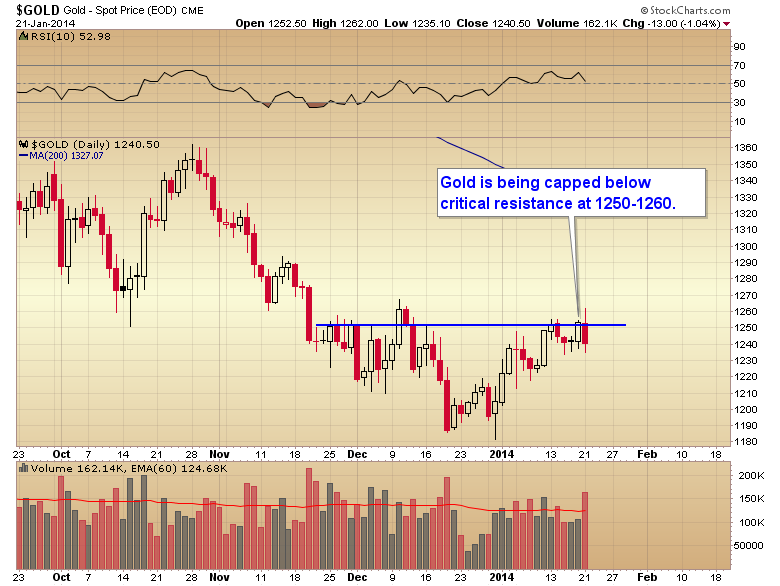 Gold has to confirm the intermediate rally first. That means it needs to break above $1268 and make a higher high. If it doesn’t do that then no buy signal will be generated. Without a reversal of the pattern of lower lows and lower highs then this is just another weak bear market rally destined to roll over and break the bulls hearts again. So far every time gold gets close to breaking through the 1250-1260 resistance zone a huge seller materializes, usually in the pre-market, to dump several million oz. of paper gold on the market and drive gold back down. This happened again yesterday. I can’t stress enough that gold has to get above $1268 before the FOMC meeting next week. 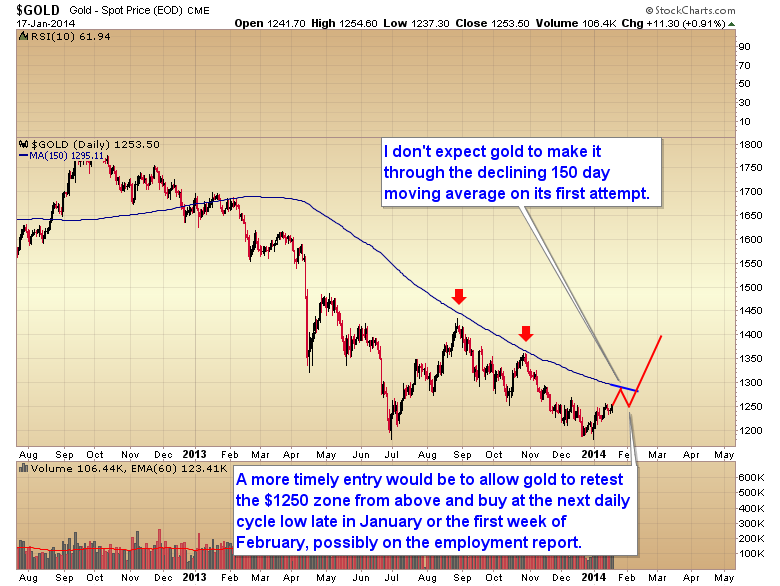 Gold can’t enter the declining phase of it’s daily cycle from a position of weakness below $1268. If it does then they are going to beat the crap out of it, and there is a serious threat that they could break the intermediate rally. 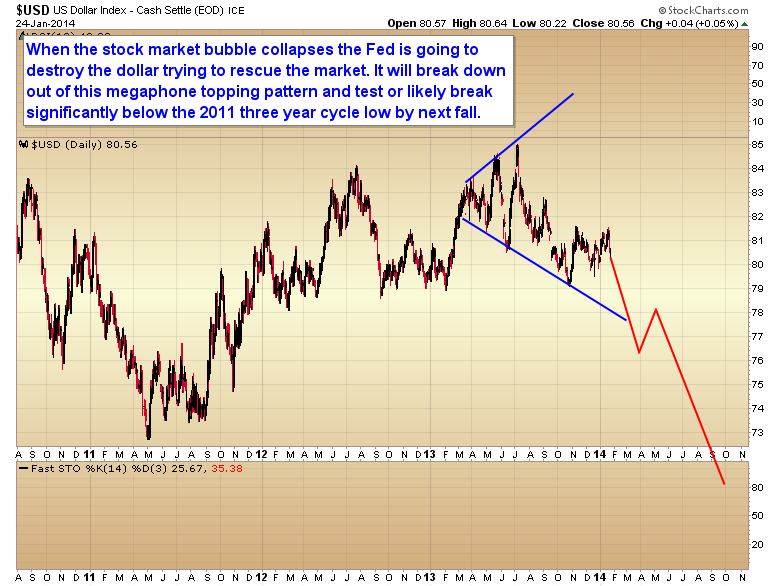 If they do break the intermediate rally then we are going to see $1030 gold over the next 4-5 months. There is a serious war ongoing for control of the paper gold market and the big seller won a major battle yesterday when they prevented gold from holding above $1250. Gold needs to recover immediately and get above $1268 so the declining phase of the daily cycle can begin from a position of strength, not weakness. So let me stress again: This is still a very dangerous market. The manipulation has not ended. Wait till the next daily cycle bottom before jumping into the sector. That bottom has to hold above the Dec. 31 low, and the only way it’s going to do that is if gold can get above $1268 before this cycle tops. That means it’s going to have to fight off the continued manipulation that’s holding it down. This entry was posted in Uncategorized on January 22, 2014 by Gary. 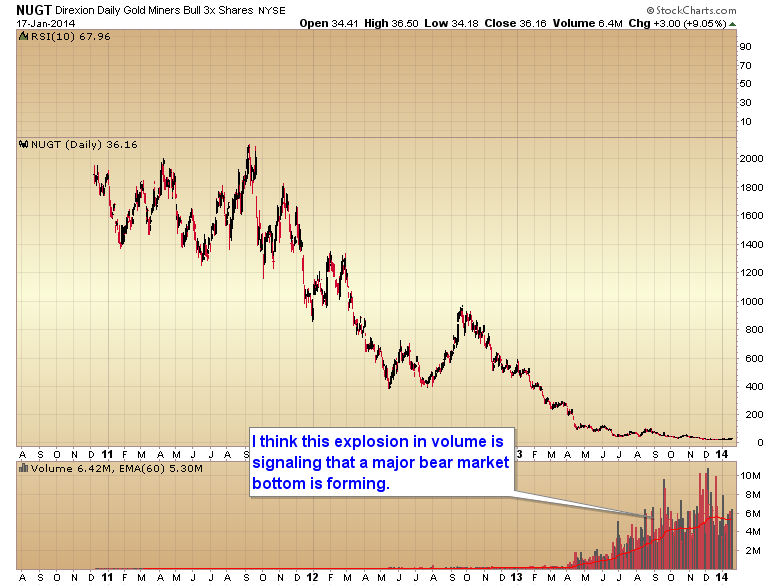 It’s been my opinion for the last several weeks that gold formed an intermediate degree bottom on December 31. That being said I’m still a bit nervous that the sector could suffer another manipulation event (like the flash crash two weeks ago) so I haven’t been willing to enter a firm long position just yet. However there are definite signs that this bear market is probably over. The large momentum divergences on the weekly charts are one. The heavy volume flowing into the ultra mining ETF is another sign that smart money is positioning for a major bear market bottom. Presently I’m waiting to see if gold can break through the intermediate downtrend line and make a higher high above the previous daily cycle top. This would confirm the intermediate bottom. Coincidentally this is roughly the same number in both cases. Gold will need to move above $1268. I would caution that a move above $1268 probably isn’t a timely entry into the sector however. As gold is going to be moving into the latter part of its daily cycle timing band by the end of next week, a better strategy would most likely be to allow gold to bounce off of the 150 day moving average and then retest the $1250 level from above at the next daily cycle low. So I think a little patience is warranted over the next two weeks. 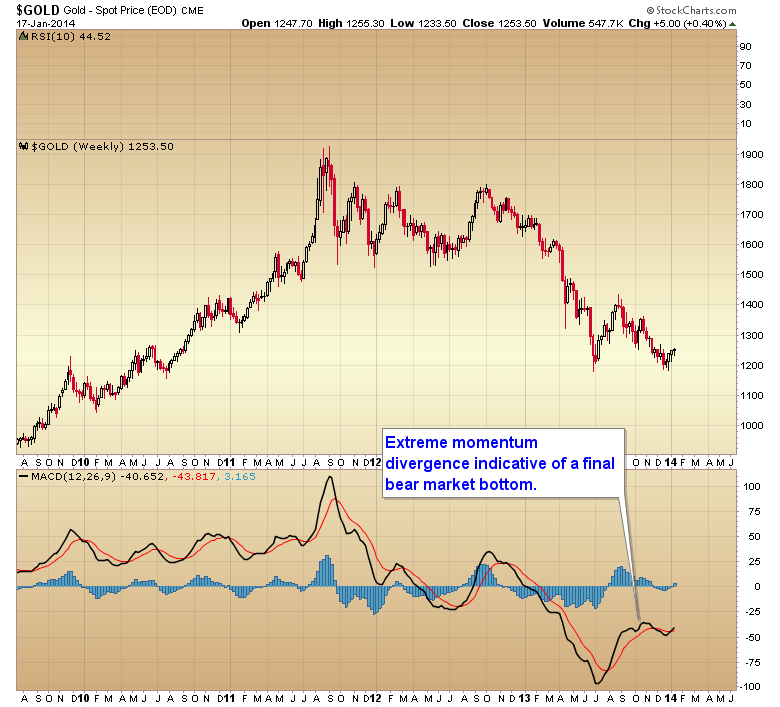 Allow gold to confirm the intermediate degree bottom. If it does, then prepare to buy aggressively at the next short-term pullback. This entry was posted in Uncategorized on January 18, 2014 by Gary. You would think with all the preaching this guy does about patience he would understand what a long term position is. 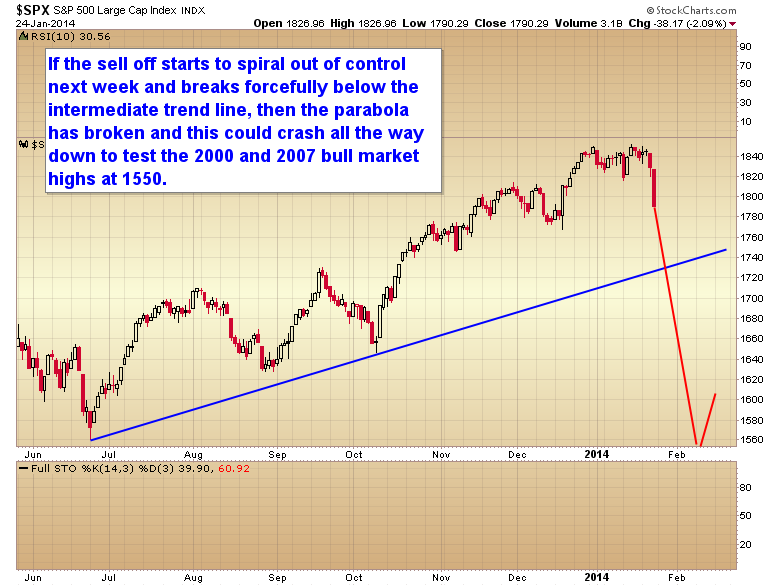 I think the cyclical bull is nearing an end. I doubt I will be able to pick a perfect top (but I’m certainly closer than Monkey boy) the 2016 puts are a bet that we will be in a bear market (and probably close to a bottom) by early 2016. Now in regard to the short term: When the Fed blatantly aborted what was almost certainly the beginning of at least a daily cycle degree correction, and probably an intermediate degree as well, on Tuesday I think it may have set the stage for a final melt up bubble top over the next 2-3 months. It seems clear the Fed isn’t going to allow the market to correct meaningfully ahead of Yellen taking office. If the market feels there is no risk and the Fed is willing to continue to pump 75 billion a month then we could have the conditions for a final bubble top. 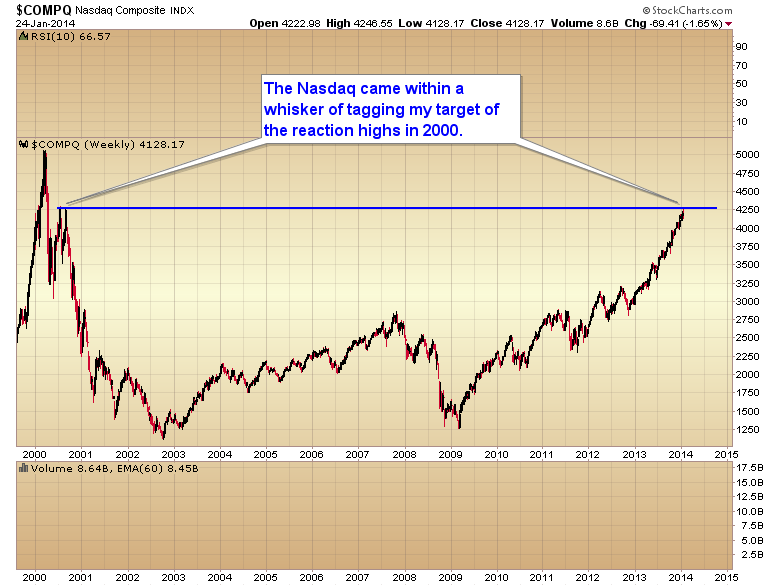 Possibly even seeing the Nasdaq test the all time highs above 5000 over the next few months. Stops are close. Right below Monday’s intraday low. So the risk is only a little over 3%. But if we do get a final melt up the potential gain is about 20%. I like those odds for a short term trade. This entry was posted in Uncategorized on January 16, 2014 by Gary. After watching the market completely reverse yesterday’s sell off it’s pretty clear that the Fed is not going to allow any serious correction in the stock market. If they did they would have to reverse their stance on tapering, and boy would they look stupid if they did that. At this point I think one has to throw caution to the winds and just buy stocks. Knowing that the Fed is going to protect the market for the foreseeable future. Sure at some point the parabolic move is going to collapse, and when it does one will lose everything, but it sure will be fun till then and a few lucky souls may even manage to get out in time before the crash. So for the time being forget about stretched cycles, forget about poor employment numbers, or weak earnings. Don’t worry about momentum divergences or trend line breaks. All one needs to know is that the Fed is handing out free money and all you have to do to get your share is buy stocks. This entry was posted in Uncategorized on January 15, 2014 by Gary. This entry was posted in Uncategorized on January 13, 2014 by Gary. This entry was posted in Uncategorized on January 12, 2014 by Gary. This entry was posted in Uncategorized on January 8, 2014 by Gary. This entry was posted in Uncategorized on January 7, 2014 by Gary. DID WE JUST SEE THE HIGHS FOR THE YEAR IN THE STOCK MARKET? I believe we have now come to an inflection point, and I think the next 2 weeks have the potential to determine the economic direction in 2014. I believe that if stocks had been allowed to trade freely they would have moved down after the last FOMC meeting and continued the failed daily cycle that was already in progress. However, it’s my opinion that the Fed rescued the market immediately after the meeting as they saw it was beginning to plunge. Let’s face it if the market had sold off hard right after the FOMC announcement of tapering then their only choice would have been to immediately reverse their decision. So I think the Fed was prepared to rescue the market if it showed any signs of weakness after the announcement. That explains the large reversal candle on December 18. 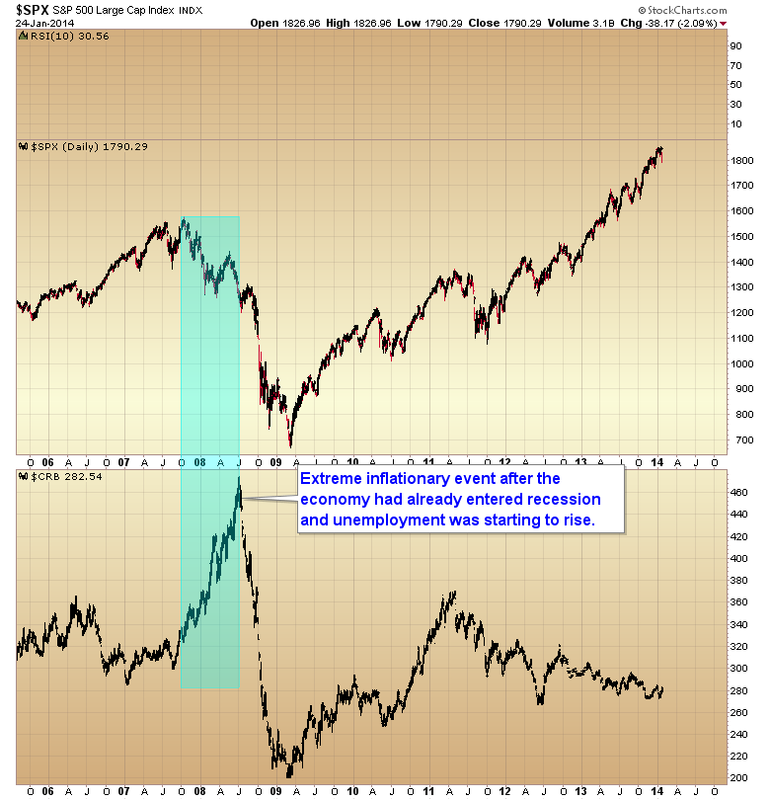 I think it was their intent to create a momentum move to try and prevent the market from correcting very similar to what they did in June 2011 as QE 2 was coming to an end. 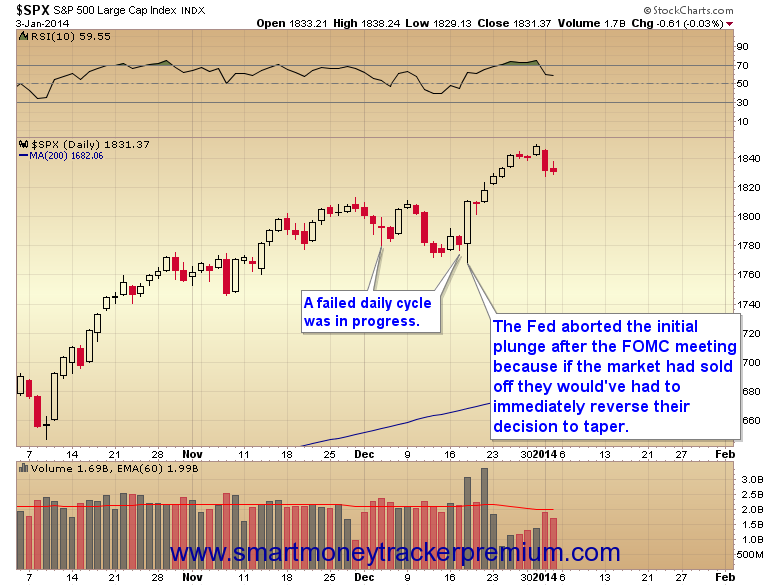 The bullish seasonality and typical Santa Claus rally helped the Fed keep this market propped up into year end. But now it looks like the momentum is running out of gas, just like the momentum in June 2011 ran out of gas. I think the next two weeks are very important, and if the Fed loses control of the stock market it’s going to put into motion unintended consequences that have the potential to push the economy back into recession. 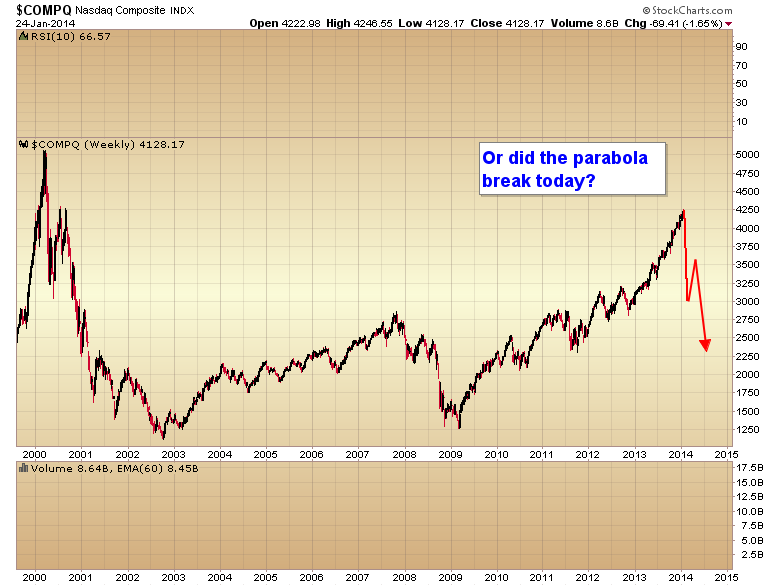 To begin with the Fed has created a parabolic advance in stocks. Parabolas always collapse. If this parabolic move is about to overwhelm the Fed and collapse then we can expect in the not-too-distant future that this silly notion of tapering will quickly go away and instead the Fed will frantically increase quantitative easing to try to rescue the stock market. This may be what the rally in the dollar is signaling. That a hard selloff in the stock market is imminent. This is the consequences of not allowing the stock market to correct naturally in 2013. 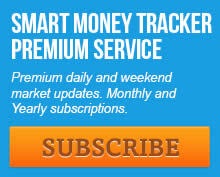 You take away all fear for market participants and create an unsustainable parabolic advance. When that parabola collapses you have a major catastrophe on your hands. This is no different than 2005 when the Fed allowed real estate prices to climb into the stratosphere. We should know within the next two weeks whether or not this parabolic move is coming to an end. More in the weekend report. This entry was posted in Uncategorized on January 4, 2014 by Gary.